My office at home is a place that I spend a lot of time. 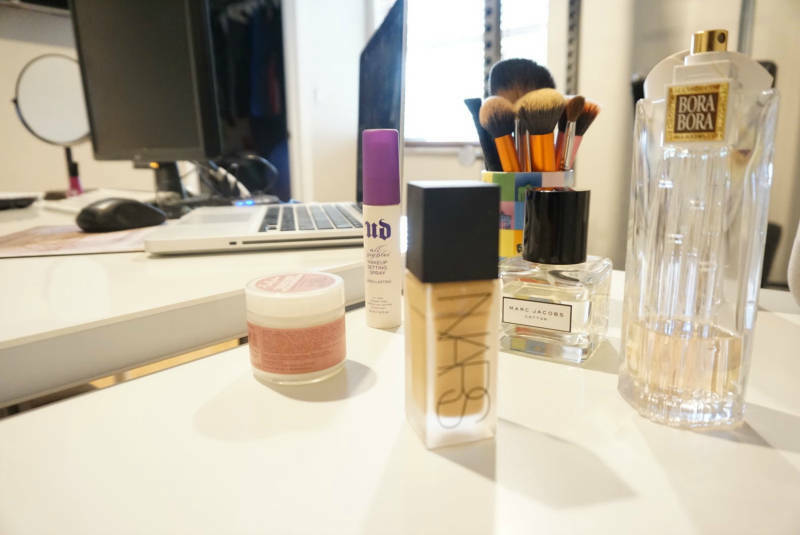 I blog at my desk every night and I also do my makeup at my desk every morning. The main portion of my desk contains my laptop (a Macbook Pro I bought back in 2012 that is still running strong), a hand-me-down monitor from Adam, my beloved Platform 9 and 3/4s mouse pad and of course my beautiful Garmin! The desk chair I’m using is also a hand-me-down from Adam. I love taking his stuff :). 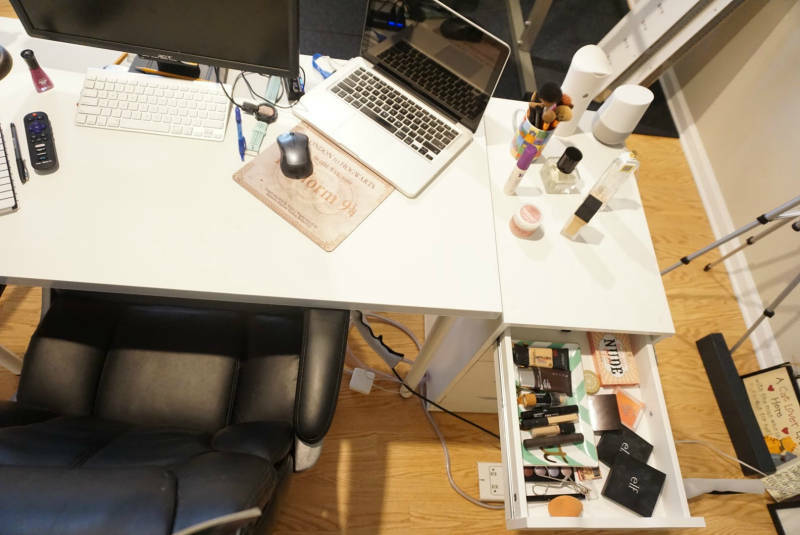 Next to my desk is a set of IKEA Alex drawers that I keep my makeup in! There are still a few items that are not cruelty-free in my collection because I feel bad throwing away perfectly good makeup, but I am now using all cruelty free products. On top of the IKEA Alex are my most used products: NARS All Day Luminous foundation in Barcelona, Urban Decay All Nighter setting spray, Shea Moisture Peace Rose Oil face moisturizer, Marc Jacobs Cotton* perfume, Liz Claiborne Bora Bora perfume (Adam’s favorite) and my favorite makeup brushes (mostly from Real Techniques). *When I bought Marc Jacobs Cotton I was under the impression that it was cruelty free as the Marc Jacobs cosmetics range is cruelty free. Unfortunately, I very recently learned that the Marc Jacobs perfume line is NOT totally cruelty free. While the company itself doesn’t condone animal testing, the perfumes are sold in China where testing is required by law. I’m pretty sad about this discovery because the perfume smells so nice. Sitting close to my perfumes and makeup brushes are two important items. The short white speaker is a Google Home. Adam and I have smart lighting throughout our house, so we’re able to say things like ok Google, turn the lights on. We also use it for listening to music and lots of other things. The taller white object is an Airwick air freshener. If you remember the other half of my office is our home gym, so having an air freshener keeps the room smelling nice! You can see there on the side I have an Airwick Dash Button for easy reorder :). The wall behind my desk is still pretty bare. Right now all that’s hanging behind me is my Endangered Species calendar. Each month features a new endangered species along with a nonprofit you can support to help save the species. I bought floating shelves to go up in the empty space so I can personalize the area a little bit more. I just need someone (*cough* Adam *cough*) to help me put them up. If I try to put them up all by myself I am sure they will end up crooked. I can do a lot of things for myself but I know when to ask for help! 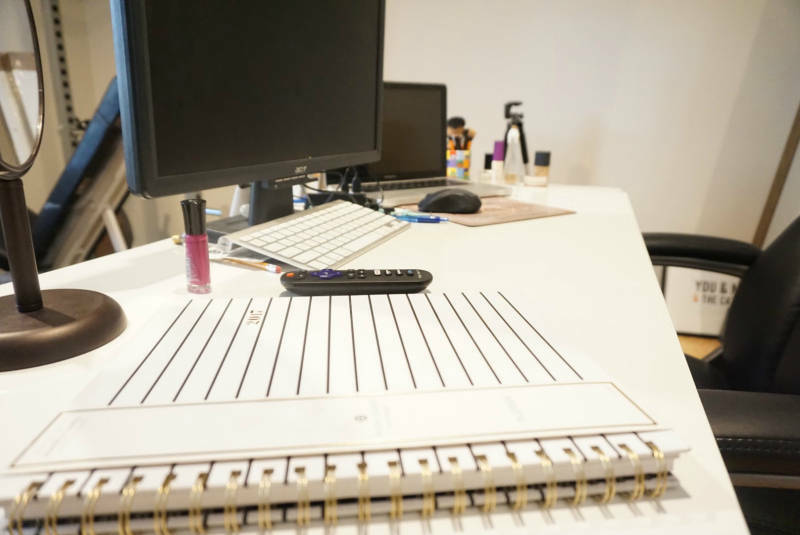 Is your desk messy or neat? What’s the most important thing you keep on your desk? Next Post Win a $100 Gift Card + Life Updates! We just put together our office and I was excited to get my desk set up. I dont use it as much as I should. Its upstairs, so sort of out of the way, and in the morning I would probably spill my coffee trying to walk back up the stairs! I dont have much on my desk but I did get some things from home goods a few week ago. That’s so interesting that you do your makeup at the desk! We have a desk at home but it never gets used. It’s in the junk room. I recently made over my office so there is hardly anything on my work desk. I just can’t stand clutter and I find the bareness of it very comforting! Your desk is so nice and organized ! I’m getting massive desk envy! My desk at work is organized and clean, I can’t work any other way. My desk at work is an organized mess 😉 I now where everything is but there are piles, I cannot lie. Oh man, my desk is super messy. All of them – my work desk, my other job work desk, AND my home desk! I don’t mean to be a messy person, but if I put something away, it’s “out of sight, out of mind”, so I need that visual reminder. Especially since I work at two offices, I lose my train of thought on a project. Awwww, love the monkey (I think) on that calendar!! YES! It is a monkey and he’s in a super cute pose!! I will have to take a closeup and send it to you because I know as a fellow animal lover you will like it! 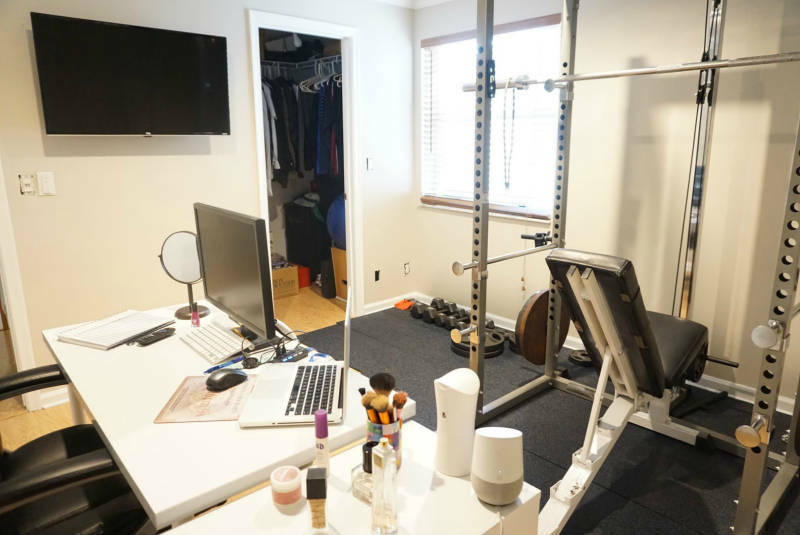 I am just now getting an office set up in my new place, also known as B’s house 🙂 It’s a combination upstairs living area / office / workout room, so decorating is kind of tricky. I would like for my desk to be facing the room, but I have it set up against a wall for now so I can get natural light from the window. I am trying to keep my desk neat because it helps me feel less stressed when I’m doing work.